You don’t need to wait for the weekend for this beautiful dish. It’s a great light midweek dinner or lunch as well as the perfect weekend brunch. We live in the age of avocado craze so admittedly this is not the first time you see a recipe like this one. But I was asked to blog the recipe by one of my followers when I posted a photo on social media…and here it is. I love using potatoes instead of bread but sourdough or other bread is a great alternative if that’s what you have handy. Poached eggs are an absolute treat for me but if you like scrambled or fried don’t let me stop you. And Dukkah, the Egyptian spice condiment the recipe for which is on my blog, lifts flavours and as another page follower said ‘makes everything taste better’. So maybe have a go at making it this week. I love smoked salmon with avocado but you can easily omit it and replace with anything you fancy, for example sundried tomatoes work really well with this dish, as does chorizo and other spiced sausage if you are a carnivore. Wash and quarter the new potatoes (skin on) and simmer for 10 minutes, till cooked. Drain and mix in a bowl with the chilli sauce, a pinch of salt and a careful splash of olive oil. Squeeze the lime juice on top of the avocado slices and sprinkle carefully with a bit of sea salt. Slice the smoked salmon into thin slices. To poach the eggs bring a pot of water to the boil. Add a tablespoon of white vinegar. With a fork or spoon stir quickly in the middle to create a whirlpool and quickly crack an egg into its centre. Simmer for 3-5minutes for a runny poached egg or a bit longer if you like it firmer. Cook one egg one at a time. Serve the egg(s) on a bed of potatoes, topped with the salmon strips and the avocados on the side. Add sliced baby tomatoes on the avocado if that takes your fancy. Sprinkle the dish with the Dukkah spice mix or a bit of salt. You can also add more mild chilli sauces of your choice like Cholula or the coriander chilli sauce from Blaencamel market stall in Cardiff. A dollop of yoghurt is mighty fine with this dish too. 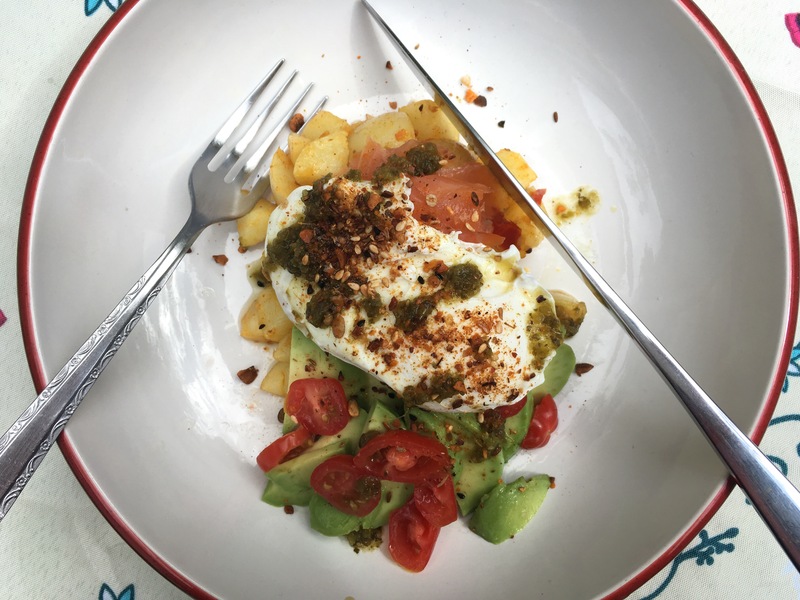 This entry was posted in gluten free, Recipes and tagged avocado, blaencamel farm, brunch, chilli potatoes, dukkah, gluten free, Lias Kitchen, poached eggs, salmon, weekend. Have you ever ordered something in a half-asleep kind of way? A few weeks ago when ordering pie ingredients from Cardiff Market I ended up with about 10kg of onions in excess even after cooking many caramelised onion pies. In the process of making the order I was wearing my astute-business-woman face, hiding tiredness from a long day at work. And the only thing I heard the helpful man say was ‘very little money for a lot of onions’ to which of course I said ‘yes’. It is unlike me to be imprecise with orders (on food or anything really) but this wonderful mistake gave me the opportunity to experiment cooking with a lot of onions within a short period of time. Admittedly Dan and I will not have onion soup again for a while. But we gratefully savoured its thyme and wine flavours during a May week when the weather had turned bad, we got ill and the heating came on again. French onion soup recipes online are plenty but my version is closest to Elise Bauer’s one on Simply Recipes because I also use no butter. And on occasion I choose to leave out the garlic and also make Gruyere cheese toast on granary bread instead of baguette croutons. The bulk of my excess onions however I turned into a spiced onion chutney. I almost followed a recipe from Allotment Growing Recipes but did not use as much sugar and added ground pimento berries, bay leaves, port and red wine. The result is a fragrant onion chutney that compliments strong and piquant cheeses competently and also works well with beef burgers. I converted and amended the recipe below for you. Make up to 9 medium jars and about 4Kg of Chutney. Heat the oil in a 5lt pot, add onions and sauté for at least 10 minutes stirring occasionally. Add the vinegars, lemon juice and spices and cook for 2 minutes. Add sugar and then simmer uncovered for at least 3 hours. Half way through cooking add the wine and port. The chutney is ready when the liquid is reduced even if not fully evaporated- it will thicken when you stir. About half an hour before the chutney is done sterilise jars. Boil clean jars and their lids in bubbling water for 10 minutes. Whilst doing that preheat the oven at 110 centigrade. Line a baking tray with a clean towel. Place the jars upside down on the tray using metal tongs. Leave in the over for 15 minutes. Ladle the chutney into hot, sterilised jars and seal immediately. Label the jars when fully cool. The chutney should keep for a year. Be prepared to peel and chop 5 Kg of onions for about hour if you have as small a kitchen as mine. I added the vinegars and lemons half an hour in the cooking process is as I was adding and sautéing onions gradually. Keep on low heat and stir regularly. Caramelised is good and burnt is bad. I put 800gr sugar but next time I’ll use less. Keep the jars in the oven if you have to wait a bit longer for the chutney to cook. The jars need to be hot if you are filling with hot chutney. Good instructions for sterilising can be found on Taste.com, an Australian website. The simple rule of jarring is to never add hot chutney to a cold jar and vice versa. This entry was posted in gluten free, Recipes, Review, Vegan and tagged chutney, french onion soup, onion chutney, spicedchutney, sterilisingjars, whattodowithlotsofonions. Today I am writing about an experiment. I have no clue whether it will work or not in its virginal attempt but I thought I’d tell you anyway because … I am excited. I have had a go at preserving lemons, which I can then use to accentuate the flavours of tagine dishes. And apparently I could even exepriment with cakes and deserts that use preserved lemons. Lemons, their colour, their scent, their flavour, their overall character brightness, mean happiness to me. My friend Becks loves the Forsythia hedge in our garden for its yellow flowers and the tone of happiness they bring into our house. They light up the scene. Lemons and their sunshine hue have the same effect on me. So on a gloomy day like this, when the sun might have gone on holiday to Spain, what better idea than to surround yourself with the colour yellow and cheer your self up! Have a lemonade and wear something yellow! Wash unwaxed lemons really well. Juice the juiciest of lemons. Then slice the leftover skin in strips. Layer the bottom of the jar with a couple of heaped tbsp of coarse salt. Cut the four lemons in four but avoid cutting through them. Cut along the middle of the lemon first and then across. Pull the flesh of each lemon open and add 1 or more tbsp of heaped salt inside it. Add lemons to the jar snuggly and top with more coarse salt. Sprinkle with peppercorns between layers. Add bay leaves to the sides of the jar. Top with strips of the juiced lemon flesh and top with more salt. Pour the lemon juice over the contents of the jar. Push down lemons with a wooden spoon to bring lemon juices out. Seal and wait patiently for at least a month for your lemons to preserve. You can also use limes. I added one lime to make the experiment more interesting. Salt takes away the lemons bitterness. Same effect it has on aubergines when you prepare them for cooking. You can keep preserved lemons for about a year. My tinterweb research reveals thta Meyer lemons are the best for preserved lemons. I just used what I had. I decided to use flavourings inspired by Snowflake Kitchen’s Blog and as I have bay leaves in abundance all year around. Punk Domestics, a directory of cooks and community activity and a gateway to cookery blogs, is how I learnt to preserve lemons. Through Punk Domestics, I filtered down my preferred preserved lemon recipes which in addition to Snowflake Kitchen’s Blog can be seen on the One tomato, two tomato, The view from the Island (with star anise) and Head Space Canning blogs. This entry was posted in gluten free, Recipes, Vegan and tagged preserved lemons, punk domestics, sterilising jars.